Our economy can support a good infrastructure, universal healthcare, and affordable higher education for its young people without demolishing lavish life styles of our preeminent families any more than other developed nations. According to a recent Gallup political poll, the two most important political problems for Americans continue to be the economy and dissatisfaction with the federal government. While this trend is not surprising, it highlights the main points of discussion that voters want addressed in the upcoming presidential election. Robert W. Merriam, Ph.D., a retired professor, who has studied the United States economy in-depth, said candidates are spending too much time on unimportant political matters. He references Hillary Clinton’s email scandal and election campaigns that are taking precedence over important domestic issues. 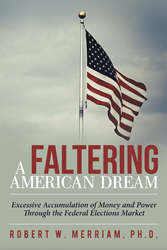 In his new book, “A Faltering American Dream,” Merriam examines the US economy as well as various topics pertinent to the 2016 presidential election. During his research, he found that the US government capabilities have slipped in comparison to other industrialized nations since the 1980s. This has resulted in rising national debt and unaffordable higher education. To combat this downturn, he believes the economy can be rectified with changes to current tax policies. According to Merriam, these modifications will result in a more involved federal government. “Our economy can support a good infrastructure, universal healthcare, and affordable higher education for its young people without demolishing lavish life styles of our preeminent families any more than other developed nations,” Merriam said. By sharing his findings, he aims to address pertinent politcal matters facing the country and offer reccomendations to improve America’s economy. “These issues need to be debated in some detail by the political parties in the 2016 election because they are very important to our country’s future,” Merriam said. Robert W. Merriam, Ph.D., is a World War II veteran and retired professor. He previously taught at the University of Pennsylvania as an assistant professor and served as the Department Chair of biological sciences at Stony Brook University. Merriam has a bachelor’s degree from the University of Iowa, a master’s degree from Oregon State University and a doctorate from the University of Wisconsin-Madison.